This Is The Perfect Toddlers First Hanukkah Dreidel. Our Colorful 9" Plush Spinning Musical Dreidel Has A Different Color Panel On Every Side – Yellow, Lavender, Lite Blue and Green - With Hebrew Embroidered Lettering. When You Depress the Red Button On Top Of The Dreidel - It Begins to Tilt And Sway Then It Starts to Spin As It Plays The Dreidel Song. Children Of All Ages Will Be Entertained Watching And Playing With This Dreidel For Many Years. Make Hanukkah Special With This Spinning Musical Dreidel. Operates on two "AA" batteries which are included. We suggest that you replace the batteries to ensure freshness and longer play time. 9 inch Maccabee plush warrior toy. Our Maccabee plush toy will become your child’s new best friend. He stands for determination, bravery and honesty. Children of all ages love our Maccabee because he has a cute, friendly smile, and he is soft and cuddly. 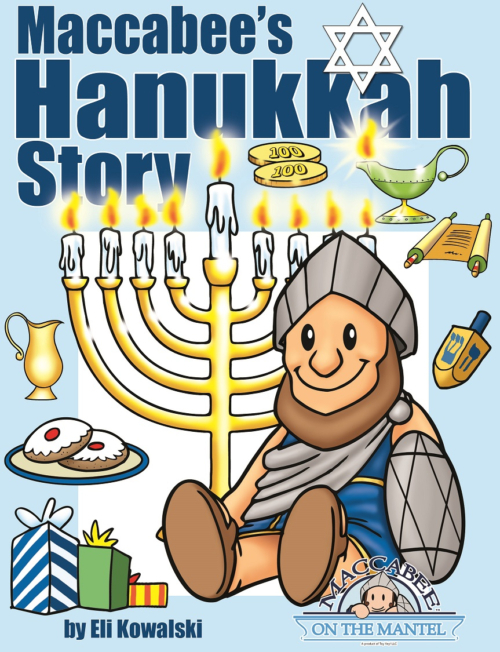 a copy of Maccabee’s Hanukkah Story, which is an easy-to-read detailed storybook that teaches the true story of Judah Maccabee who rallied his family and friends and miraculously defeated the Syrians and regained their destroyed Temple in ancient Jerusalem. 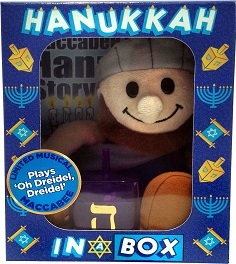 an easy to spin gold embossed 3 inch plastic, refillable dreidel (which you can fill with your own special goodies), enjoy spinning the dreidel and playing the dreidel game while and singing the traditional dreidel song with your musical Maccabee warrior plush toy. This New Maccabee’s Hanukkah Gift Set is the perfect gift for anyone who wants to learn how to celebrate this holiday in its traditional way. Included in this gift set is our award winning, extra-large padded, hardback storybook Maccabee’s Hanukkah Story, which tells the true story of how Judah Maccabee rallied his family and friends and miraculously defeated the Syrians and regained the destroyed Temple in ancient Jerusalem. The storybook contains blessings that are recited during the daily Hanukkah candle lighting and teaches the proper way to light the candles. It also highlights a few traditional songs that are sung during Hanukkah. 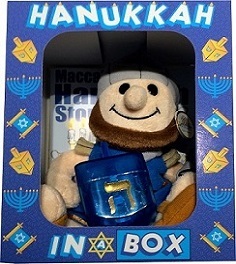 Also included is a Maccabee plush warrior toy and a plastic refillable dreidel. a limited edition 9 inch Musical Maccabee plush warrior toy. When you press his tummy he plays Oh drediel, dreidel, dreidel song. Our Maccabee plush toy will become your child's new best friend. He stands for determination, bravery and honesty. Children of all ages love our Maccabee because he has a cute, friendly smile, and he is soft and cuddly. an easy to spin gold embossed 3 inch plastic, refillable dreidel (which you can fill with your own goodies), enjoy spinning the dreidel and playing the dreidel game while and singing the traditional dreidel song with your musical Maccabee warrior plush toy. See below for the demo video of our Muscial Maccabee plush warrior toy with off/on switch built in the tummy area. This award winning, 24 page 10” x 10” extra-large padded, hardback storybook tells the true story of how Judah Maccabee rallied his family and friends and miraculously defeated the Syrians and regained the destroyed Temple in ancient Jerusalem. This storybook contains blessings that are recited during the daily Hanukkah candle lighting and teaches the proper way to light the candles. Beautifully illustrated in rich colors. Have fun playing with this classic plastic silly spring. Maccabee's Hanukkah Story is the winner of the 2016 Creative Child Magazine Book of the Year Award. This book conatins 20 illustrated pages that are bright, colorful and meaningful. The story teaches the true story of Hannukkah and the Maccabees. Also included are blessings for lighting the Hanukkah candles, traditions songs and how to play the dreidel game. 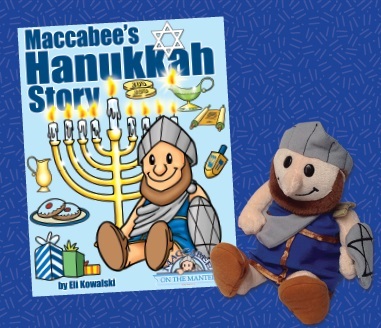 Young children will enjoy reading or having this book read to them, so start a new Family Tradition by reading Maccabee's Hanukkah Story to your children or grandchildren.